Today I’m at the Sales 2.0 Conference in San Francisco. I write about Marketing Automation, so why am I at a sales conference? I’m here because I believe Sales & Marketing should be on the same team. Marketing Automation can help both Marketing and Sales, but it requires intense collaboration: that’s what Sales 2.0 is all about. This morning we saw a demo of Salesforce.com Chatter, a collaboration tools integrated with Salesforce.com. Think Facebook built into Salesforce.com: it looks just like the Facebook timeline, but it is built around your sales processes. You can follow coworkers, prospects, deals, documents but also 3rd party applications. That last feature made me think: Marketing Automation systems can also tie into Chatter, and use it as the primary means of communicating with the sales teams. That could be a great way to close the gap between marketing and sales. Lead Tracking and alerts are nothing new in Marketing Automation. Many systems send email notifications, special reports in the CRM system or sometimes even instant messages. But it’s always Marketing who decides which alerts will be sent (and when), not the sales person. With Chatter, sales people can subscribe to activity updates of specific leads, or groups of leads. It’s the Twitter model (choose to follow), instead of the email marketing model (the sender pushes updates). My guess: sales people will love being in charge of the alerts they receive. Once you have the Chatter infrastructure in place, a Marketing Automation system could pass lots of different alerts on to Chatter. Social Media monitoring? Yes, you can get alerts when your company or competitors are mentioned in the Blogosphere. The company newsletter was just sent out? See how your prospects respond to it. Does an employee of one of your target accounts visit the corporate website? See it in real-time. All in one place, and controlled by the end-user. In most of my blog posts I try to give practical advice that you can use right away. This post is a prediction: Chatter will be rolled out this summer, and it will take Marketing Automation vendors some time to tie into Chatter. Nevertheless, I see a great future for Chatter. I’d love to hear your take (especially if you’re not convinced yet!). 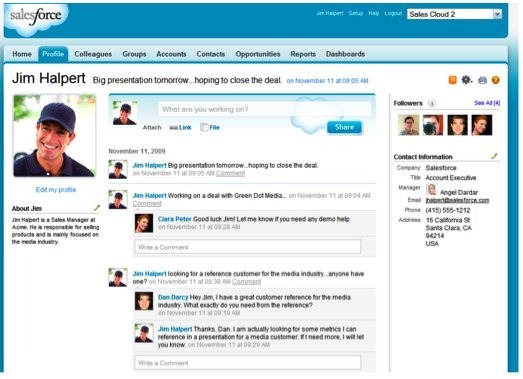 This entry was posted in Demand Generation, sales 2.0, Sales Force Automation and tagged chatter, lead tracking, sales and marketing alignment, salesforce.com on March 8, 2010 by Jep Castelein.